ISPM researchers found that young children living in the close vicinity (<100 m) of a highway have an increased risk of leukaemia. 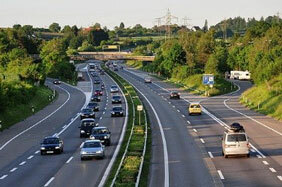 Traffic emissions contain substances, such as benzene, that are known carcinogens. This week, a study by Ben Spycher, Claudia Kuehni and other researchers from the ISPM together with colleagues from Bern, Basel, and Lausanne was published in European Journal of Epidemiology suggesting that traffic related pollution may increase the risk of leukaemia in young children. The researchers included all children in the Swiss National Cohort aged less than 16 years - over 2 million children – and identified children who developed cancer through the Swiss Childhood Cancer Registry. They compared risk for different cancer types (including leukaemia, lymphoma and brain tumours) in children living less than 100 m , 100-250 m and 250-500 m from the nearest highway to that in children living more than 500 m from a highway. Among children living closest to highways (<100 m) the risk for leukaemia was found to be about 50% higher. When the researchers looked at different age groups, a twofold increase in risk was found in children aged 0-4 years, but no evidence of an increased risk in older children.